Morticia Knight is a new-to-me author. 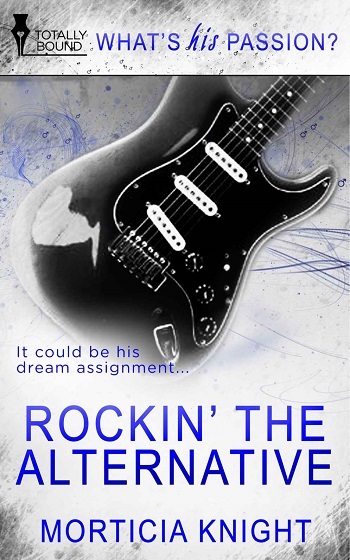 Rockin' the Alternative is the prequel to Rockin' It Forever. Rock God, Aubrey King, contacts Bryan to write his memoir, not realizing the young man idolizes him. This short story takes place over the course of one evening, more than half of it lusty between-the-sheets action as the rockstar manipulates the straight writer into exploring his sexual boundaries. Not that Bryan isn't more than willing. Obviously this is a short story, so expect things to move quickly. I enjoyed the easy flow of Knight's writing style. However, with this being the initial meeting as a prequel to the full-length book, it was too soon with the insta-lust connection between the pair, the needy rockstar, and the bending by the music writer. Ending it all with talk of forever after a handful of hours together. All in all, it removed the buildup and tension. But I will reserve my thoughts on whether or not this helped or harmed the flow, buildup, and tension during the full-length novel. I have a hard time once the characters give into their passions, as it makes the story feel finished to me, yet the story has just begun. Reviewers on the Wicked Reads Review Team were provided a free copy of Rockin’ the Alternative by Morticia Knight to read and review.